As expected, I’m receiving very positive feedback from new Hinode Super Wide users. Yes, I agree this is my lifetime item too. 24-30 degree actual field of view is really joyful to look around. See some of 30-degree field of views I simulated before. It reminded me how fun the wide field bino-viewing was. So I decided to scale down my 90FL Bino to 50Ach bino. I wished to make the 10 x 50 erecting-mirror binocular with 25mm Ortho eyepiece. But I gave some to friends or customers(I should have kept them…..). So 18mm is longest 1.25″ (and old ortho) I have at this moment. So so far 14 x 50 binocular. ** Someone, is there any recommended 1.25″ 30mm eyepiece? Please advise me. Anyway, first step to do is the fundamental collimation. 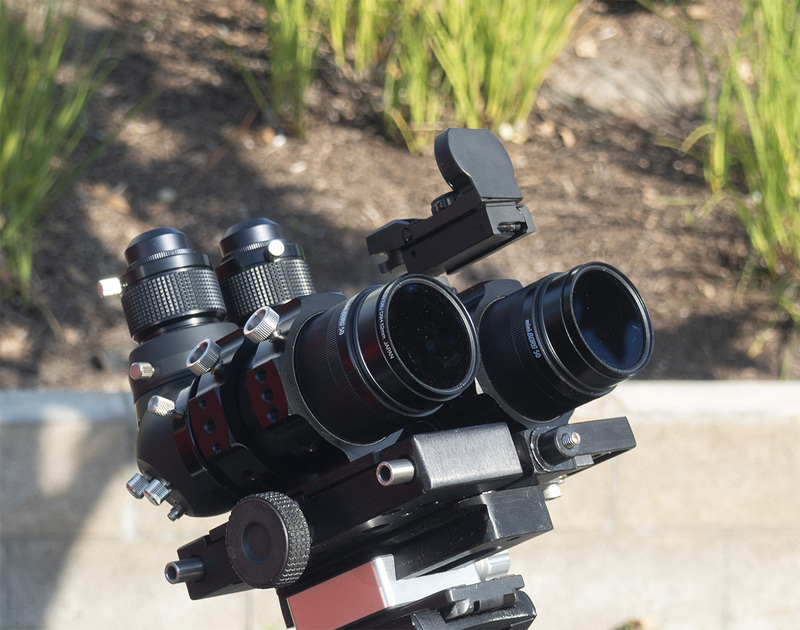 This minimizes touching mirror collimators for last fine tuning under the night sky, which allows for binoscope viewing at 300x or even more. Thanks for AOK’s easy mechanical design. Vertical. But I didn’t have to do this time. Since the alignment was needed only horizontally, the setup was done only 5 minutes after I took it outside. And I was just curious how today’s sun was. So I put two IDAS solar filters in front. Unfortunately very clean plain face……. Anyway, it’s ready to use nighttime as well as my 1.8x constellation bino. For a while, I will enjoy sky surfing with these two binoculars. And I will put ones of IDAS LPS filters to make the background darker from my backyard. ~ by tedishikawa on November 20, 2018.